On Jan. 16, Parallax launched its online literary magazine and the Idyllwild Arts students had a big party to celebrate. Parallax, which means, “a displacement in the apparent position of an object viewed along two different lines of sight,” is often used by astronomers to measure distance. It’s also a cool name for a student literary magazine featuring multiple viewpoints. Parallax has been published in a printed form since 1997, but just two years online. 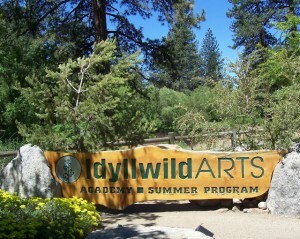 It showcases the writing of Idyllwild Arts students, mostly from the Creative Writing Department, but also from other majors, including Interdisciplinary Arts (IM), theatre, dance, music and moving pictures. The students have expanded Parallax online to include submissions from other high school students worldwide. 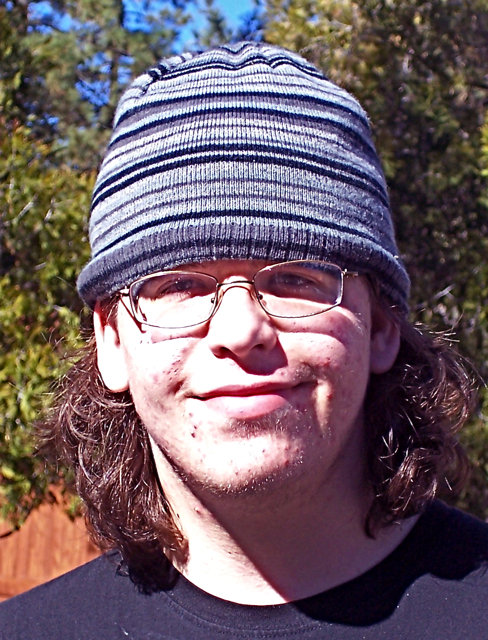 Isaac, one of the editors, said the criteria for submissions was basic. He went on to say that Parallax is not just a web site for writers. Well, you can see for yourself at www.parallax-online.com. It showcases the poetry, short stories, screen plays, theatre plays and essays. 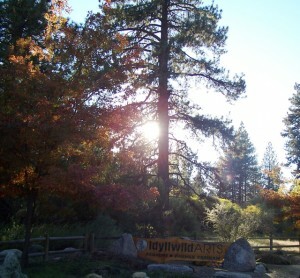 And some of the best visual images, photography and comics by visual artists at Idyllwild Arts. The combination is colorful, edgy, earthy and pretty terrific. “Who says that high school students can’t write seriously, or that our voices can’t spark conversation within the literary community?” asked Whitney, the publication’s Editor-in-Chief. Some of the poems and story excerpts now featured online were recited on the night of the online launch. One by one, students came up to the “stage” before the fireplace, and recited their works. There was no microphone, and probably a predetermined time limit, but the works were high caliber and could match up to any Chicago “Poetry Slam.” The audience of 100, made up of students, faculty and staff, was enthusiastic and respectful. It also helped that there was good hors d’oeuvres and raffle prizes. “The next raffle prize is a bunch of Jesus post cards,” quipped Rebecca, as she called out the winning number amongst the holiday lights and decorations. 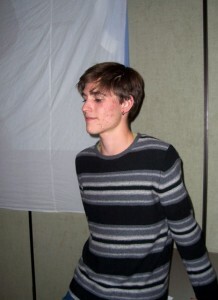 Some of the Creative Writers were theatrical in their recitals, like Isaac, who transferred from the Theatre Department last year. Branford dressed for the occasion and told a chilling tale of murder, mystery and lab rats. 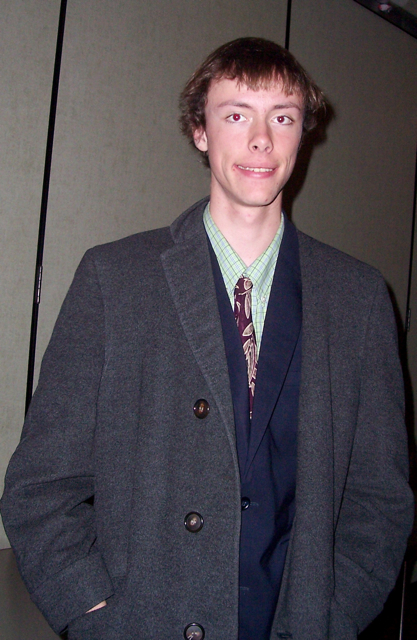 Branford, a tall, lanky guy who was dressed up in a suit for the occasion, was the most theatrical with his loud, deep voice as he read his excerpt from “Door 29.” It was a graphic journey about lab rats, and an audience favorite, including Tima’s 12-year-old son, who wants to be a writer. “He was the best,” the boy said. 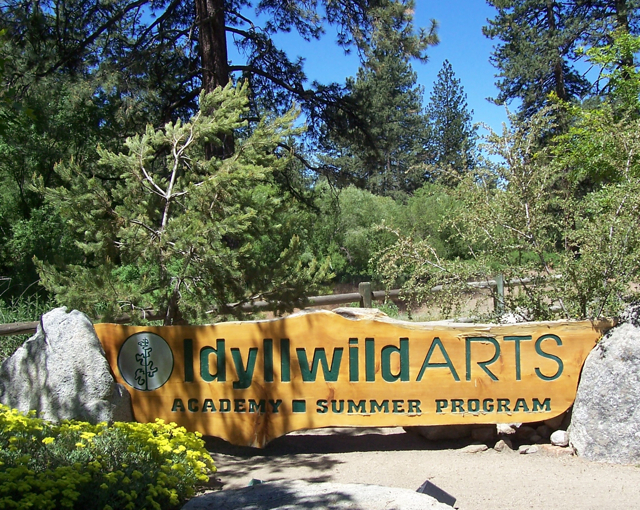 Whitney recited “Cain’s Lament,” a modern poem about Cain and Abel, that was set to music by Arik, and sung by Samuel, fellow music students, at “Idyllwild Arts Day in LA” last year. 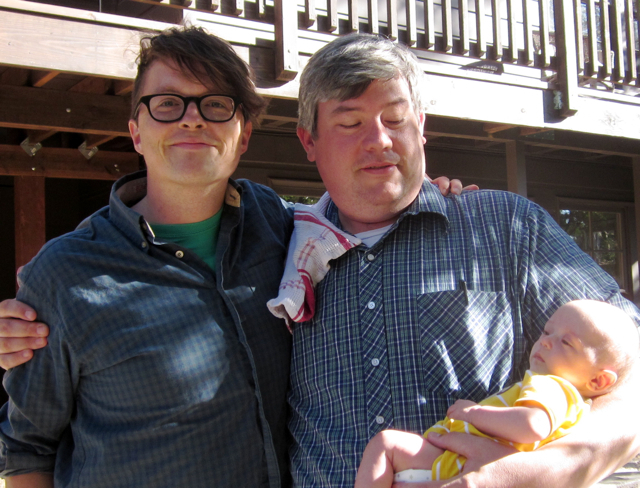 (You can hear Arik and Samuel’s version sung before the printed piece at Parallax online). “I just love this,” whispered Andrew Leeson, an instructor from the Creative Writing Department. Over dinner God told us he was an atheist. He spelled it out for us: A-T-H-E-I-S-T. Christ admitted to being agnostic. “What happens,” my brother asked, “when you don’t believe in yourself?” God put an arm around him, led him to the edge of the wine glass, directed his clean eyes upon the World. "We're looking for good writing," exclaimed Isaac, a Creative Writer. “A child was murdered quietly in a market. A soldier shot civilians in the street as they pressed their heads against the barrel of his gun. A king ordered his subjects to hang each other and one by one they twitched and were still. A nuclear bomb obliterated one-third of the world’s population, but no one happened to be looking that way just then. God stepped away from the wine glass, brushing smears of human blood from his sleeve. Becky, Scarlett, Ariel, Erin, Michelle, Freida, Dante, Callie, Ruth and Maria all read short stories, and poems, to end a remarkable evening, a literary celebration. You can read them all online at www.parallax-online.com, or go to the Idyllwild Arts web site, www.idyllwildarts.org, and click on Creative Writing and Parallax. In other news, three creative writers–Scarlett, Becky and Maria–left for the Association of Writers & Writing Programs (AWP) Conference & Bookfair in Chicago today. 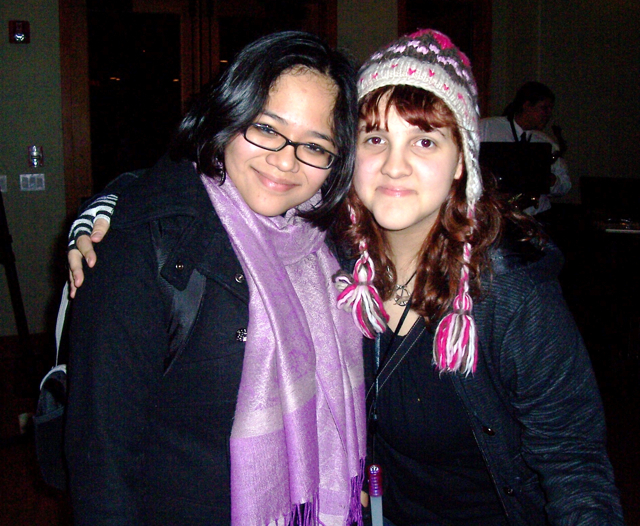 They will be reading and attending the 3-day event that starts on tomorrow, March 1, at the Palmer House Hilton. Other AWP presenters include: Jimmy Santiago Baca, Bonnie Jo Campbell, Jennifer Egan, Forrest Gander, Thomas Sayers Ellis, Philip Levine, Ed Robertson, and Jane Smiley, among others. For more information, visit www.awpwriter.org. Zach Savich, considered one of the “New American Poets,” by the Poetry Society of America, will be conducting a Master Class for the creative writing students at Idyllwild Arts Academy at 3 p.m. today. Then at 6 p.m., the students will take over and recite some of their work at the Parks Exhibition Center. Then at 7:30 p.m., Zach will read excerpts from one of his poetry books. It’s been a whirlwind trip for the poet who had to get up at 3 a.m. this morning to catch a shuttle to get on a 6 a.m. flight from Denver. 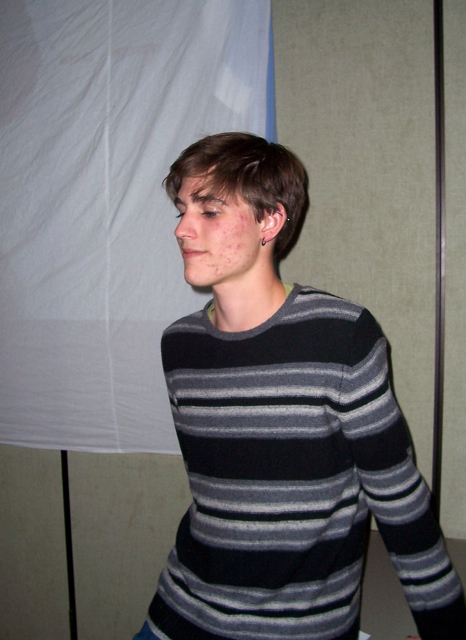 Last night, he recited at an art gallery near Fort Collins. “It was really nice to look around and see beautiful artwork on the walls, instead of just rows of chairs,” Zach said. He’s a friend of Kat Factor, head of the Interdisciplinary Arts (IM) Department at Idyllwild Arts. They went to graduate school together at the University of Iowa Writer’s Workshop. Now, just a few short days before Spring Break, the creative writing students were looking forward to Zach’s arrival. 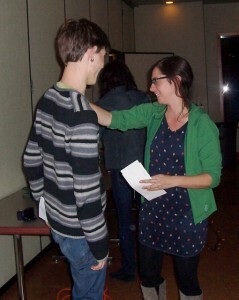 To introduce them, Kat sent Zach some of their poetry. He said the group of 14 creative writing students likely read his book of poetry before his arrival today. Some of the questions that he receives from students, in general, is how to get a poetry book published. He said for him, it was relatively easy working with small publishers who make beautiful books, and take care of the promotion. He hopes to impart some of his experiences as a poet and teacher to the group today. Zach’s Master Class and Reading is the last in a series of guest artists sponsored by the IM Department. It begins at 6 p.m. tonight, March 11, at the Parks Exhibition Center. 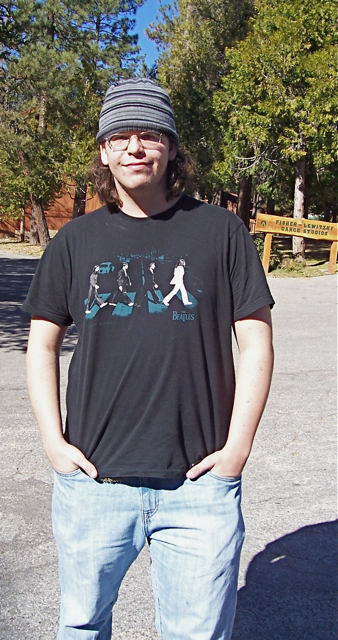 The students will read their work followed by Zach’s reading at 7:30 p.m. Like all event held at Idyllwild Arts, it’s free and open to the public.